This slow cooker salisbury steak recipe is made with tender beef patties topped with mushroom gravy. Classic comfort food that's super simple to make! In a large bowl, combine the beef, egg, breadcrumbs, milk, garlic powder, onion powder salt and pepper. Mix thoroughly then shape into 6 patties. Heat the olive oil in a large pan over medium high heat. Add the patties in a single layer and cook for 4-5 minutes on each side or until golden brown. 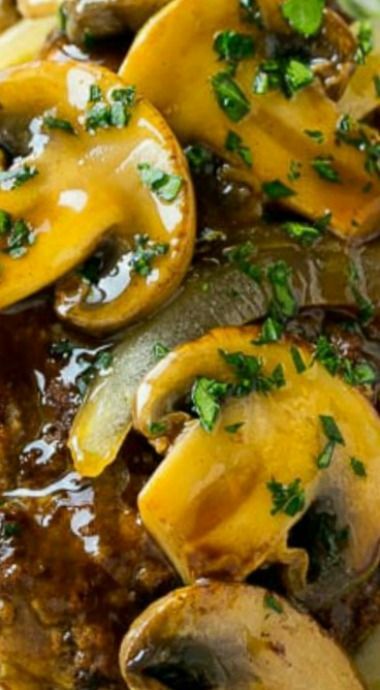 Place the mushrooms and onion in the bottom of a slow cooker. Add the patties on top. Pour the gravy and beef broth into the slow cooker. Cover and cook on LOW for 4-6 hours. 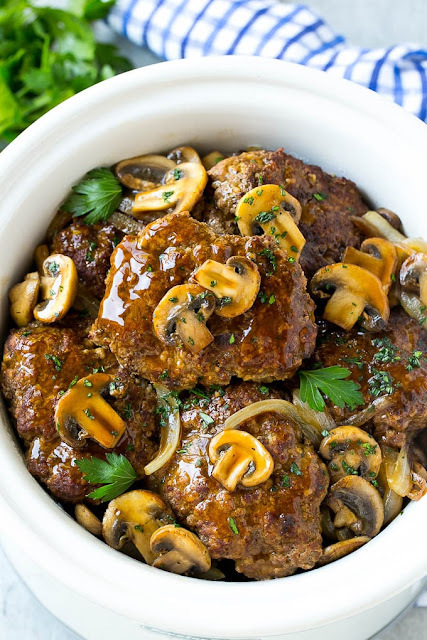 Remove the patties from the slow cooker and place on a plate. Cover to keep warm. Combine the cornstarch with the water and pour into the slow cooker. Turn the slow cooker to HIGH and cook for 3-5 minutes until sauce is thickened. Spoon the sauce over the patties. Top with parsley and serve.